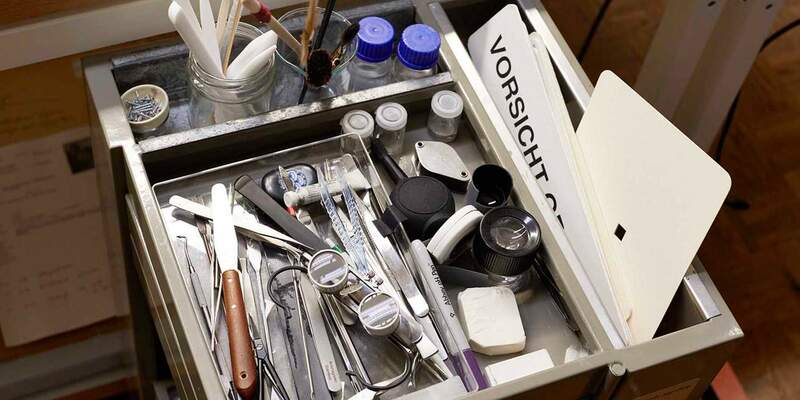 Nathalie Bäschlin, head restorer at the Kunstmuseum Bern (KMB), gives us an insight into her everyday professional life: documented in text, visual and audio form. Picasso, Klee, Monet, Hodler and Oppenheim: The Kunstmuseum Bern's collection includes masterpieces from the world's most famous artists of the 19th and 20th centuries. Nathalie Bäschlin knows them inside out – after all, she has worked on many of these masterpieces herself. The head restorer at the KMB ensures that the fragile cultural assets remain in good condition and intervenes in cases where time has left its mark. She takes us through her varied professional life and gives us an insight into four eventful days. 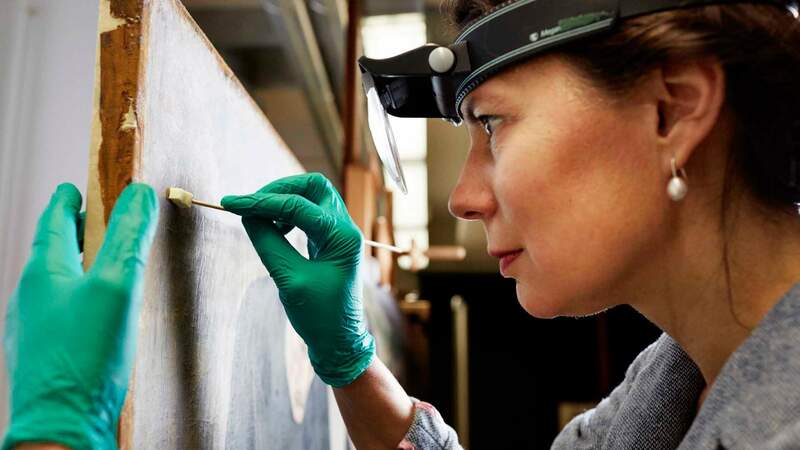 Nathalie Bäschlin is the head restorer for paintings, sculptures, and contemporary art at the Kunstmuseum Bern. Her team looks after works of art made from different materials and originating from different periods. In addition to paintings and sculptures, these works include graphics, prints, and video art. Bäschlin also teaches and researches as a lecturer at the Bern University of the Arts. Today I'm accompanying a shipment to Lugano. We are bringing 12 works of art on loan to the LAC Lugano Arte e Cultura cultural center for the Meret Oppenheim exhibition. We have brought the crates safely into the LAC and stored them in the air-conditioned exhibition depot. Works of art react sensitively to environmental changes. Fluctuations in temperature and air humidity can result in material changes. That is why it's important for the crates to be able to acclimatize to their new location – they won't be unpacked until Monday. We use the goods elevator to bring the crates to the exhibition rooms. One crate is too tall to fit in the elevator. The painting in this particular crate is not from our collection but I know it well and can tell the technicians how they can tilt the crate without the work being damaged. Once they have been unpacked, the condition of the works is logged. All of the paintings have arrived intact. We turn to the graphics. One of the pieces to be featured in the exhibition is a portrait of Meret Oppenheim by the US photographer Man Ray. As with another photo from Ray, the photo of Meret Oppenheim is untitled. As it turns out, there has been a mix-up with the photo: The photo that we have brought to Lugano is not the intended one. The number in the loan agreement is in fact correct, but the museum had wanted to exhibit another untitled photo. Nevertheless, exchanging the photos by making another shipment is out of the question. Now it's the turn of the sculptures. For each work, a piece of paper indicates its intended location within the exhibition. We hesitate with one of the sculptures: The plinth earmarked for the piece by the museum does not fit in with the overall aesthetics. We find a more suitable plinth, which still needs to be painted. Time for the first meeting with my team. A colleague is accompanying two sculptures by Marina Abramović to Stockholm. The sculptures have a delicate surface and even a scratch would quickly result in a write-off. During transport they must be supported firmly and at the same time the contact material must not leave behind any marks. We pad the crate with a polyethylene foam; this plastic has a chemical property that means it does not react with most materials. As a result, it offers a safe, yet neutral environment. Afterwards we talk about innovations in the field of pest prevention. The horror of what happened last time is still on all of our minds: A woodworm got into the pallets in our external warehouse and from there entered the museum. The damage was significant: We had to analyze every transport crate, clean everything, and replace all of the pallets. As we found out later, freshly felled wood from coniferous trees is rather susceptible to these worms. We have now learned our lesson. In commemoration of the 100th anniversary of the 1917 October Revolution in Russia, the Zentrum Paul Klee and the Kunstmuseum Bern are holding an exhibition entitled "The Revolution is dead. Long live the Revolution!" Two of my colleagues discuss how things are progressing with the exhibition manager. We are expecting works from all over the world for the exhibition and we have just ten days to set things up. Many loans are coming from Russia, where bureaucracy slows everything down. The technicians bring me a small painting by Paul Klee from the depository. "Zwergmärchen" [Dwarf Fairy Tale] is the name of the work from 1925. It belongs to a foundation that wants to show it in an exhibition in Budapest. I need to check whether the work can be transported safely. To get an initial impression of its condition, I take the painting out of its frame, photograph it, and gather various pieces of information about it. I make notes and add them to the technical entries in the database. Then I start my analysis: I examine the painting with a microscope and a UV light and carefully check it for loose areas using a fine tool. Klee combined several cardboard and plaster layers and nailed them to a wooden frame. Wood expands and shrinks, which has led to tears in the plaster between the cardboard and the frame. Vibrations could cause significant damage here. The painting can only be transported under very special conditions, if at all. "Die enttäuschten Seelen" [Study of the Disappointed Souls] by Ferdinand Hodler is going to an exhibition in New York this summer. In the 1980s, the large-format painting was taken from its original wooden frame and stretched onto a new metal frame. The corners of the frame are damaged and it is heavy. We remove the painting. It will soon get a new wooden frame. After lunch, I take another close look at the Hodler painting. A spotlight reveals wax deposits on the surface of the picture. A restorer rubbed the painting with beeswax in the 1930s, and it is possible that this has separated a little over the years. The small speckles have a mattifying effect that is almost invisible to the visitor. I dab the wax deposits with a small sponge: It must contain virtually no water to ensure that no paint is removed. A boy has touched a painting. I hurry over to the exhibition rooms. The work does not appear to be damaged. I am relieved that everything is alright this time. A while ago I had to carry out a lot of work on a painting that got dented when a child brushed against it with their backpack. I devote myself to the Klee painting again. I notice that the varnish, the protective layer on the watercolor, has turned cloudy. This is affecting the paint quality and must be rectified. However, first I need to find out what material the artist used – Klee didn't provide any information about this. I will need to take a sample of the varnish and then bring this to the art technology lab for analysis. It is crucial that I take the sample from the right place: It needs to be small, but still contain all the materials used where possible. Only in this way will the lab report provide a reliable basis upon which I can start the delicate cleaning work. 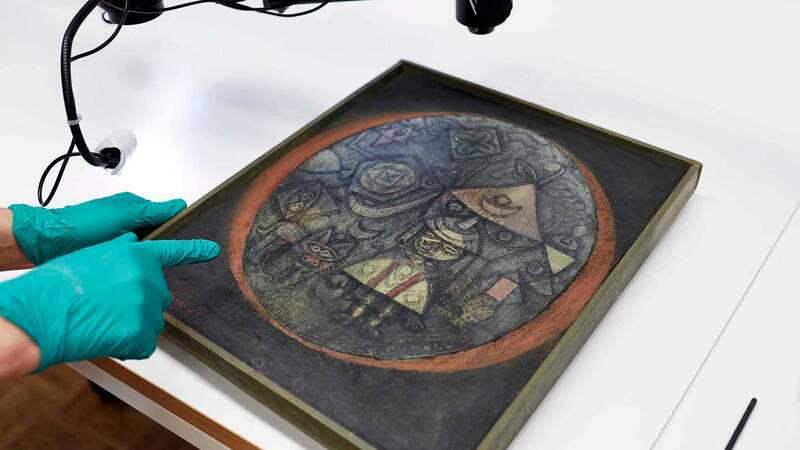 Restorers receive cultural works such as paintings, sculptures, textiles, books, image, sound and data carriers, structures, and archaeological findings. 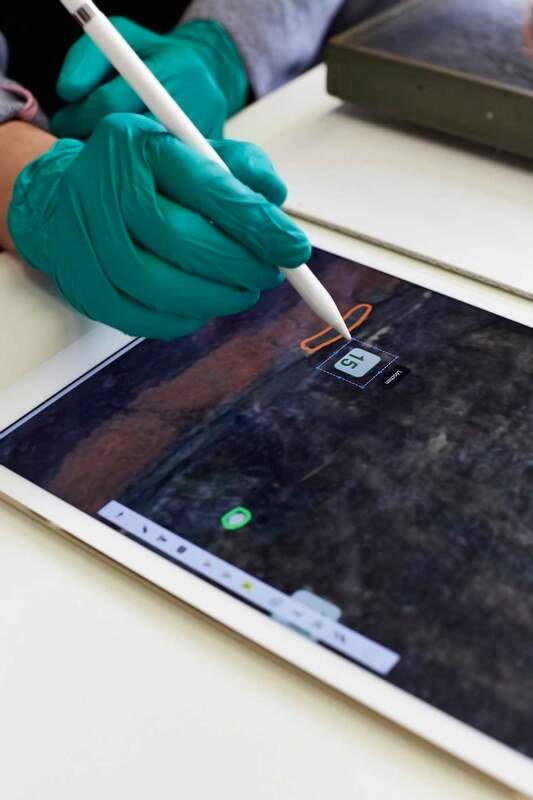 They check the condition of the items, analyze quality and materials, and decide how the works should be conserved and restored appropriately. 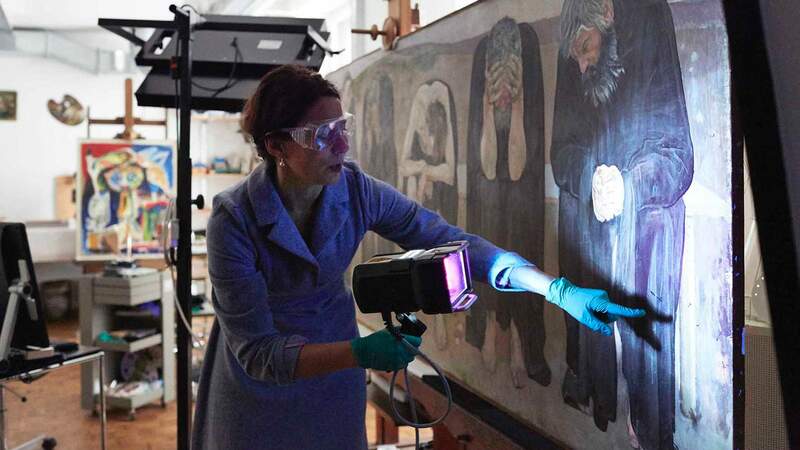 Many of the restoration processes, for example removing or applying paint, are carried out manually by the specialists, however they also use technical aids and computers. Degree courses in conservation and restoration are offered at universities. Credit Suisse has been working with the Kunstmuseum Bern (KMB) since 1996. The bank is a partner of the art museum and supports one or two exhibitions per year.